Appellant :- State Of U.P. And 3 Ors. This special appeal has arisen from a judgment and order of the learned Single Judge dated 2 December 2015. The learned Single Judge has allowed the writ petition filed by the respondent and has directed the correction of his date of birth in the service record of the Irrigation Department of the State Government as 15 February 1959 in place of 15 February 1956. The learned Single Judge has allowed the writ petition at the stage of preliminary hearing, without calling for a counter affidavit from the State on the basis that in view of the "undisputed facts and the documents on record" the petition would be decided without the defence of the State being placed on the record. The respondent was appointed as a helper in the Irrigation Department on 1 November 1978. The application submitted by the respondent for appointment indicates that he was 22 years of age and had failed at the High School examination. The age of the respondent was entered in his service book as 15 February 1956. The date of entry in the service book is 17 February 1984 and bears the thumb impression of the respondent together with his signature. On 22 June 2004, the respondent submitted an application to the effect that his date of birth has been wrongly recorded as 15 February 1956 instead and in place of 15 February 1959. 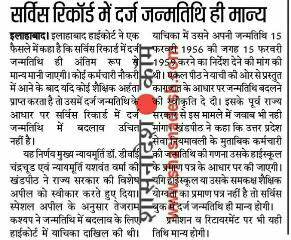 In support thereof, the respondent relied upon a certificate issued by the Principal of the Rajkiya Inter College, Bareilly dated 29 March 1990 indicating that the date of birth of the respondent in the records of the institution is 15 February 1959. The certificate indicates that the respondent had appeared at the High School examination in 1978 which he cleared but the institution has still not received the High School certificate from the Secondary Education Board. The learned Single Judge while allowing the writ petition has relied upon the circumstance that the identity card of the respondent issued by the Irrigation Department mentions his date of birth as 15 February 1959 and that the High School certificate which was produced by the respondent before the Court indicated the date of birth as relied upon by the respondent. The learned standing counsel has urged that at the time of preparation of the service book, the respondent had duly signed the entry which indicated that his date of birth was recorded as 15 February 1956. The learned Single Judge rejected the submission by holding that the respondent is still in service and has been agitating his claim for correction of his date of birth since 2004. For these reasons, the learned Single Judge allowed the writ petition and directed the correction of the date of birth from 15 February 1956 to 15 February 1959. At the outset it would be material to refer to the provisions of the U.P. Recruitment to Services (Determination of Date of Birth) Rules, 19741. "2[2. Determination of correct date of birth or age. -The date of birth of a Government servant as recorded in the certificate of his having passed the High School or equivalent examination at the time of his entry into the Government service or where a Government servant has not passed any such examination as aforesaid or has passed such examination after joining the service, the date of birth or the age recorded in his service book at the time of his entry into the Government service shall be deemed to be his correct date of birth or age, as the case may be, for all purposes in relation to his service, including eligibility for promotion, superannuation, premature retirement or retirement benefits, and no application or representation shall be entertained for correction of such date or age in any circumstances whatsoever.]" Rule 2 indicates that the date of birth which has been recorded in the High School certificate or in respect of an equivalent examination, shall be deemed to be the correct date of birth for all purposes in relation to his service. Where a government servant has not passed the High School or equivalent examination as aforesaid, the date of birth or age recorded in the service book at the time of his entry into government service, shall be deemed to be the correct date of birth. Rule 2 further provides that where a Government servant has passed the High School examination after joining the service, the date of birth or the age recorded in his service book at the time of his entry into the Government service shall be deemed to be his correct date of birth or age, as the case may be, for all purposes in relation to his service. In the present case, the application submitted by the respondent when he entered upon service indicates that he had disclosed his age to be as 22 years and that he had failed in the High School examination 'High School Anuttirna'. The respondent joined services on 1 November 1978. The case of the respondent himself is that he had initially failed in the High School examination and that he appeared in the supplementary examination which he cleared. Now, when the respondent submitted an application on 22 June 2004, the first thing that needs to be noticed is that it was addressed to the competent authority in the Irrigation Department nearly twenty six years after he had joined the service. In the meantime, as we have noted, the service book of the respondent reflected his date of birth as 15 February 1956 and it bears both the signature and thumb imprint of the respondent. Hence, the respondent was aware of the fact that his date of birth has been entered as 15 February 1956. This also tallies with his disclosure in his application seeking employment which indicates that his age was 22 years in 1978. This application, it may be noted, was in terms of the form prescribed under the standing orders applicable under the Industrial Employment (Standing Orders) Act. Even when the respondent submitted his application for correction of the date of birth on 22 June 2004, he relied upon a certificate of the Principal of the Inter College dated 29 March 1990 which, while stating that the respondent had passed the High School examination in 1978 and that his date of birth in the records of the institution was 15 February 1959, stated that the institution had not received a copy of the High School certificate from the Secondary Education Department. The case can be considered from either of two stand points. Firstly, as a general principle, it is well settled that an application for correction of the date of birth in the service record, made belatedly and a long time after the employee had entered into service, should not be entertained. This principle must apply to the facts of the present case, where as we have noted, the respondent himself declared his age as 22 years when he sought employment in 1978 and his service book was completed in 1984, duly endorsed by the respondent indicating that his date of birth was 15 February 1956. Twenty six years thereafter, the respondent sought correction of his date of birth. His submission that he had submitted his High School certificate when he joined service is clearly belied by his own statement made in his application for employment that he failed in the High School examination at that stage. Equally significant in the present case, is the principle which is contained in Rule 2 of the statutory rules which have been framed in exercise of powers conferred by Article 309 of the Constitution. Rule 2 provides that in the first instance a date of birth of a Government servant as recorded in the certificate of his having passed the High School or equivalent examination at the time of his entry into the Government service shall be deemed to be his correct date of birth for all purposes in relation to service. Where a Government servant has not passed the High School examination or an equivalent examination, the date of birth or age recorded in the service book at the time of entry in the service is to be taken for all purposes as the correct date of birth. Rule 2 also provides that in a situation where an employee has passed the High School examination after joining the service, the date of birth entered at the time of his entry in service or age recorded in the service book at the time of his entry into Government service shall be treated as the correct date of birth. In this background, both on facts as we have indicated and having due regard to the provisions of law noted above, the learned Single Judge was manifestly in error in entertaining the writ petition and in directing the grant of relief for correction in the date of birth of the respondent from 15 February 1956 to 15 February 1959. The writ petition ought not to have been entertained in the first phase having been filed in 2015, for seeking correction in the date of birth. When the writ petition was filed, the respondent was virtually on the eve of his retirement. A long time after the respondent had entered into service, a correction in the date of birth in the service record ought not to have been entertained. We, accordingly, allow the special appeal and set aside the impugned order and judgment of the learned Single Judge dated 2 December 2015. In consequence, the writ petition filed by the respondent shall stand dismissed. The delay of forty four days in filing the special appeal is condoned since sufficient case has been shown in the affidavit filed in support of the delay condonation application. The application is, accordingly, disposed of.